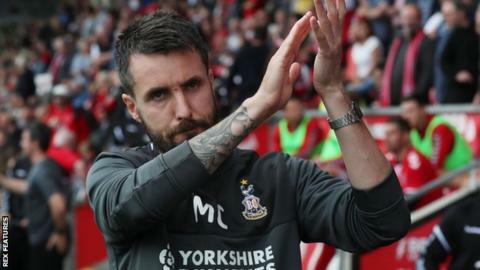 Bradford City have sacked head coach Michael Collins after six league games. The 32-year-old, who was the youngest boss in English professional football, was in his first senior post having been promoted from his role as the club's under-18s manager in June. City, who are 17th in League One, will announce his successor on Tuesday. Bradford have lost four of their past five league matches and were knocked out of the Carabao Cup on penalties by EFL newcomers Macclesfield. "The decision is based on an unsatisfactory start to the season and performances not being good enough," chairman Edin Rahic said in a statement on the club website. "We anticipated a much better start and the results have not matched expectations." The Bantams edged out last season's beaten play-off finalists Shrewsbury Town 1-0 at the New Meadow on the opening day of the season. But losses to Barnsley, Southend, Wycombe and Fleetwood were split by a win at home to Burton Albion as City scored just four goals under Collins. His successor will be the fourth man to take full-time charge at Valley Parade this year. Stuart McCall was sacked after six successive losses in February before Simon Grayson left the club at the end of the season when his contract expired. "We have acted swiftly to appoint a new head coach who we believe will take us towards achieving our goals this season and beyond," added Rahic. "We care massively about this football club and believe this decision has been made at the right time, with everything very much to play for. "We are now looking forward to naming our new head coach and moving forward, together, in a positive manner."